This system was designed and integrated into customer's existing injection molding machine. It was programmed to audit at least two shots of 32 plastic parts every full box. A top mounted high resolution Cognex Vision camera was programmed to gage the part ID, OD and concentricity. A side mounted high resolution camera verified part height and presence of other features. An uphill transfer conveyor with integrated part cooling system was used to move parts to the inspection area or divert them to the box loading area. A precision weigh scale was used to verify correct part counts per shot. The PLC/HMI included operator settings for full box counts and weight. The control system automatically advanced full boxes away and new empty boxes in to the filling area. 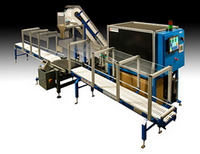 The compact system included a dust cover over the material handling conveyors.